On the heels of Pantone's announcement of Emerald as 'Colour of the Year 2013,' the popular design magazine Computer Arts from the UK asked designers about their thoughts on the selection. I was humbled to be asked my opinion and have the identity I'd done for The Katie Boyce Company published in the article. You can pick up Issue No. 210 of Computer Arts at the newsstand, or read the piece below. What do designers think of Pantone's Colour of the Year 2013? If the recently reformed New Order want to demonstrate that they're still with the times in 2013, they should consider updating the title of one of their iconic songs to 'Everything's Gone 17-5641.' In early December 2012, Pantone Color Institute revealed its 2013 'Colour of the Year' to be Pantone 17-5641, better known as Emerald. Pantone's executive director Leatrice Eisman explained that the accolade – arrived at after 12 months of global trend-spotting by Pantone's colour experts – was clinched by the shade's "sense of clarity, renewal and rejuvenation." For Marco Costa, design director at Portuguese furniture design company Boca do Lobo (www.bocadolobo.com), Pantone's announcement was perfectly timed. Just a week before, he had launched the Diamond sideboard, an updated version of a piece he had originally created in purple in 2007, with an exterior featuring silver leaf covered in vivid, high-gloss translucent emerald. "Pantone could not have chosen better," Costa enthuses. "I had prior knowledge of the 10 possible colours for 2013, and I let myself be seduced by the powerful and strong emerald." For him, the shade is ideal for the luxury end of interior design. "Emerald is an inspiring and uplifting colour suggesting abundance and wealth in all its forms, from material and emotional well-being to creative ideas. It has an amazing power to communicate." Jack Muldowney (www.jackmuldowney.com), a Chicago-based designer, is also ahead of the pack, as in 2012 he completed a new identity for The Katie Boyce Company, a political consultancy, using emerald and cream. "I felt the emerald shade was the perfect marriage of approachable, playful and respected, trustworthy tones,"
he explains. "Emerald green denotes a sense of life and energy, and it does so in a refreshingly 'non-trendy' way. This selection is interesting to me, in that it's an ode to the classic while being just as vibrant in modern applications." Muldowney also sees the shade as versatile enough for a range of design settings: "Green is often considered gender-neutra and associated with a revival or renewal," he says. 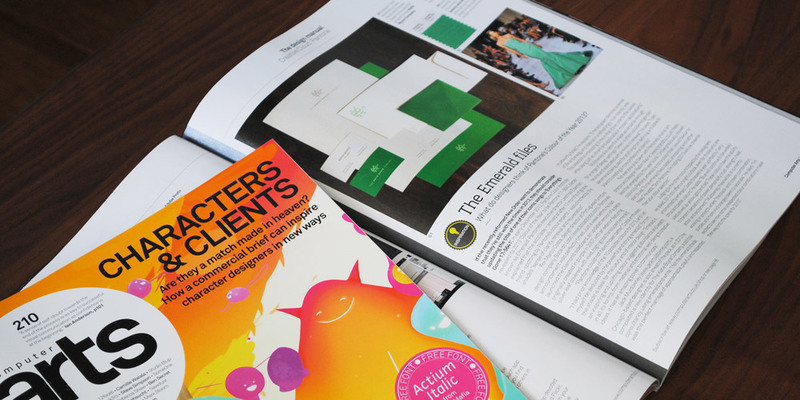 "I can see Emerald being used for anything from defining a children's brand to creating a more professional identity." Not everyone is so taken with Pantone's choice: art director and designer Radim Malinic (www.brandnu.co.uk) feels less than energised by this year's pick. "Unlike previously chosen colours by Pantone, Emerald is not a colour that I would favour or plan to use. To me, Emerald feels dated, uninspiring and rather heavy." He adds: "Sorry Pantone, I'm hoping 2013 will be cheerier than your colour selection." Judging by the other colours tipped by the designers we asked, 2013 still offers a bright outlook, even for those who are unconvinced by Emerald. Costa foresees a year uplifted by "very citrus and pastel colours." He adds: "Blue will continue to be widely used, as well as yellow, gold and red. These colours have the ability to transmit sensations of power, personality, trust, strength, heat, action and excitement." Muldowney, meanwhile, is currently working on projects where the black-and-cream combination, purples, and more vivid oranges seem to resonate. He says" "I'm excited to see how some unexpected colour combinations make their way onto the scene for 2013."